Background: Cerebrospinal fluid (CSF) rhinorrhea, when left untreated, can lead to meningitis and other serious complications. Treatment traditionally has entailed an open craniotomy, although the paradigm has now evolved to encompass endoscopic procedures. Trauma, both accidental and iatrogenic, causes the majority of leaks, and trauma involving skull base and facial fractures is most likely to cause CSF rhinorrhea. Diagnosis is aided by biochemical assay and imaging studies. Methods: We reviewed the literature and summarized current practice regarding the diagnosis and management of CSF rhinorrhea. Results: Management of CSF leaks is dictated by the nature of the fistula, its location, and flow volume. Control of elevated intracranial pressure may require medical therapy or shunt procedures. Surgical reconstruction utilizes a graduated approach involving vascularized, nonvascularized, and adjunctive techniques to achieve closure of the CSF leak. Endoscopic techniques have an important role in select cases. Conclusion: An active surgical approach to closing CSF leaks may provide better long-term outcomes in some patients compared to more conservative management. Cerebrospinal fluid (CSF) rhinorrhea is a condition that results from an acquired communication between the central nervous system and external environment. CSF rhinorrhea may present spontaneously or following trauma and if untreated may lead to ascending meningitis and other complications. Management often requires the collaborative care of multiple clinicians. Although CSF rhinorrhea has been traditionally treated with open surgical procedures, the introduction of the rigid endoscope for minimally invasive endonasal procedures has revolutionized treatment for many patients. We review current practice regarding the diagnosis and management of CSF rhinorrhea. Leaks may be identified during the early posttraumatic period, or leak presentation may be delayed. An active surgical approach to closing CSF leaks from defects at the skull base may provide better long-term outcomes compared to more conservative management, particularly in patients who have a prior history of ascending bacterial meningitis.6 Delay in leak presentation may be attributed to resolution of associated brain edema, devascularization of tissue, formation of the fistula tract, and resolution of blood products, all of which can result in increased ICP. 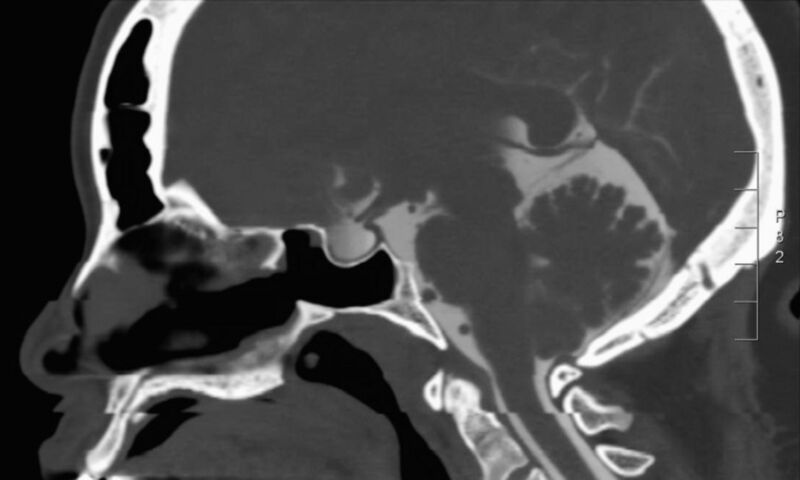 Spontaneous CSF leaks often result from skull base dehiscence and bony erosion from sinonasal and intracranial lesions. While the pathophysiology of spontaneous CSF rhinorrhea may vary, the underlying etiology has implications for prognosis and treatment, particularly in patients with occult increased ICP. 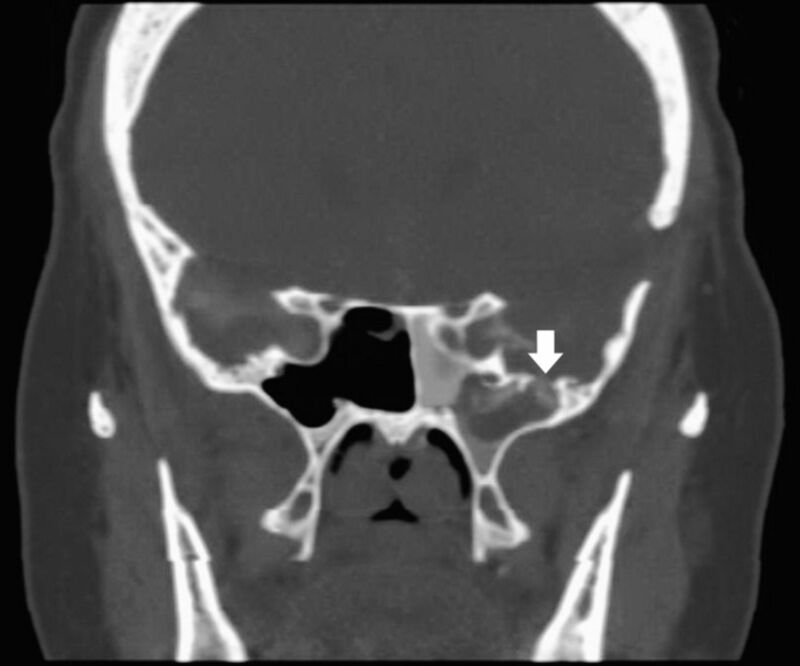 Patients with a history of major trauma may have acquired a skull base defect at the time of injury that has slowly expanded from normal intracranial pulsation, rendering the location of dehiscence vulnerable to leakage. Patients with a likely normal CSF physiology—and therefore higher surgical success rates—can have spontaneous CSF leaks resulting from congenital paranasal sinus pneumatization with skull base dehiscence. In patients with nontraumatic increased ICP, a CSF leak can often be attributed to an intracranial lesion with mass effect, hydrocephalus, or benign intracranial hypertension (Figure 1).12 Diagnostic findings include the absence of localizing neurologic signs, increased CSF pressure, normal CSF count and chemistries, papilledema on fundus examination, and a lack of other identifying etiology of increased ICP.13 An ICP pressure finding >20-25 cmH2O often requires treatment.14 Clinical symptoms are sensitive to postural changes and the Valsalva maneuver. Sagittal magnetic resonance imaging shows an empty sella in a patient with benign intracranial hypertension. The pituitary gland is compressed inferiorly (arrow). Patients presenting with unilateral clear nasal discharge associated with nonspecific headache symptoms raise suspicions for rhinorrhea of cerebrospinal origin. Patients can also present with mental status changes, seizure, and meningitis, thereby requiring a high level of suspicion for accurate diagnosis.15,16 Rhinorrhea secondary to a CSF fistula can be provoked by placing the patient's face in a downward position and observing for leakage for several minutes. Patients with a CSF leak and benign intracranial hypertension may also display bilateral papilledema. Computed tomography cisternogram shows enhancement of the subarachnoid space in a patient with elevated intracranial pressure. Once a CSF fistula has been identified, management is dictated by the etiology of the leak, its location, and its flow volume. High-flow CSF leaks rarely close spontaneously and often require surgical intervention. For low-volume leaks, conservative measures may be employed. Spontaneous leaks with low or intermittent volume may be managed conservatively with bed rest, head elevation, avoidance of straining activities, and temporary CSF diversion with a lumbar drain.25 Because the majority of CSF leaks caused by closed head injuries resolve spontaneously, trauma patients may be conservatively managed unless they experience neurologic deterioration or are diagnosed with additional intracranial pathology.19 When conservative management fails, surgical repair is indicated. Endoscopic procedures are performed endonasally through the sinonasal tract with a rod-lens endoscope that uses linear or angled optics to visualize the roof of the sinonasal cavity. Various procedures and materials can be used for endoscopic reconstructive procedures, including autologous grafts, nonautologous grafts, and surgical adjuncts such as tissue sealants. Grafts are used for the following functions: (1) to fill a space through mass effect, (2) to re-create a watertight layer, (3) to act as a rigid buttress, and (4) to stabilize a wound edge. Fat has expansive qualities that allow it to be used for mass effect, while fascia, acellular dermis, rotational flaps, and mucosal grafts are used for watertightness because of their high collagen levels. Cartilage, bone, and synthetic miniplates are well formed and can act as rigid buttresses. Wound edges are often stabilized with cellulose, gelatin sponge, and tissue sealant. Nonvascularized reconstruction is a practical option for the endoscopic repair of small or low-volume CSF fistulas. Nonvascularized techniques can also be used in conjunction with vascularized reconstructive techniques, particularly in complex defects. Inlay graft materials include autologous tissue such as fascia lata, as well as acellular dermis and other synthetic materials. These grafts may be applied within the intracranial space and tucked against the intracranial surface of bony ledges. Onlay grafts can be similarly applied to the extracranial surface of the skull base, in which case they require additional materials for bolstering. Consequently, onlay grafts have limited use in isolation but are commonly used as part of multilayer reconstructive techniques. Composite grafts, consisting of a mixture of inlay grafts, onlay grafts, tissue sealant, and supporting materials, are often used for moderate-sized defects with active CSF leakage. Composite grafts are versatile and can be combined with a pedicled, vascularized flap approach in patients with large defects and high-volume CSF leaks. Vascularized flaps have greatly enhanced the capabilities for endoscopic skull base reconstruction. These flaps, including nasoseptal flaps and turbinate flaps, are vascularized via an axial blood supply that allows for increased flap survival. By comparison, intranasal free grafts have a random blood supply that limits their versatility when large grafts are needed. The nasoseptal flap is one of the most widely used vascularized flaps for skull base defect repairs (Figure 3).22 Its ease of harvest, large mucosal surface, favorable arc of rotation, and ability to cover sellar, suprasellar, clival, and anterior skull base defects make the nasoseptal flap a commonly used option for vascularized reconstruction. Doppler sonography can be used to assess the viability of a proposed flap site.28 Posterior and central sinonasal defects can be repaired with the inferior turbinate flap, particularly with a posterior pedicle.29 This flap uses the posterior lateral nasal artery, a branch of the sphenopalatine artery, for vascularization. Large anterior fossa defects can be repaired with a vascularized lateral nasal wall flap that involves the inferior turbinate and nasal floor mucosa with an anteriorly based pedicle.30 The middle turbinate flap is an additional option when the septum or inferior turbinate is not available as a donor site.31 Adverse effects of flap use include flap necrosis, flap displacement, and donor-site morbidity. 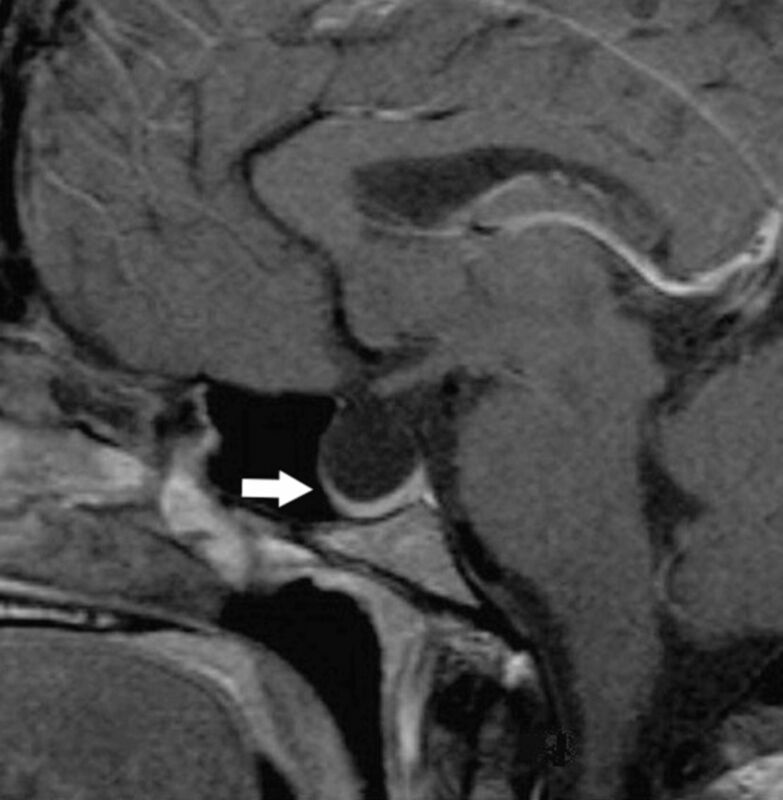 Sagittal magnetic resonance imaging shows a pituitary macroadenoma prior to removal with an endoscopic transsphenoidal approach. The large postsurgical defect in the skull base required a vascularized nasoseptal flap as part of the reconstruction. Tissue sealants can be used during reconstruction to add stability to a multilayered repair. Fibrin matrix–based and synthetic compounds are available. However, synthetic tissue sealants are rarely used as the primary material to close CSF leaks.32 Both types of material are effective but are relatively expensive. Coronal computed tomography shows a defect in the floor of the middle cranial fossa producing a cerebrospinal fluid leak into the pneumatized sphenoid wing (arrow). 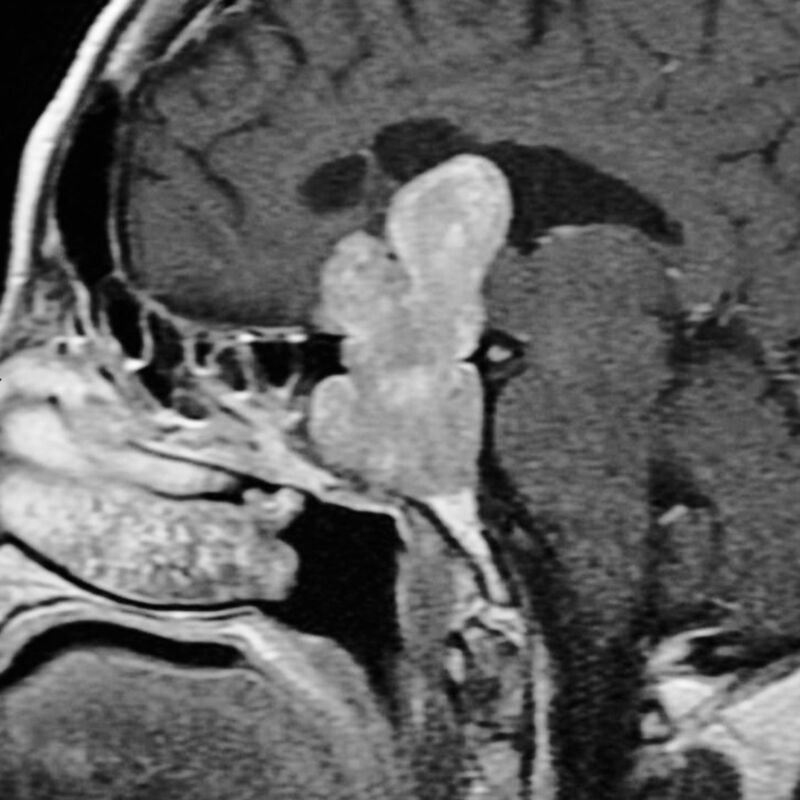 The left sphenoid sinus is filled with contrast fluid after the injection of intrathecal contrast. Repair of cribriform and anterior ethmoid defects typically requires a mucosal graft overlaid with bioabsorbable materials and nonabsorbable packing to support the graft.35 Exposure of bony edges is followed by the removal of surrounding mucosa and application of reconstructive materials. Repair of CSF rhinorrhea has evolved from requiring an open craniotomy approach to a minimally invasive endoscopic procedure. Trauma causes the majority of cases of CSF rhinorrhea, and an active surgical approach to treating CSF leaks may provide better long-term outcomes in select patients compared to more conservative management. Spontaneous CSF fistulas have lower closure success rates compared to traumatic fistulas and require more monitoring because of the possibility of recurrence and increased ICP. A combination of biochemical assay with radiologic studies is typically required to secure a diagnosis and guide management. Adjuncts such as intrathecally injected fluorescein can aid diagnosis and treatment plans. When conservative management fails, endoscopic repair of CSF leaks is an option in the modern surgical armamentarium. Craniotomy remains a possible approach for repairing leaks that are severe, recurrent, or not amenable to minimally invasive repair. The approach to repair a CSF fistula depends on the location of the dehiscence, the fistula size, and the flow volume. Several reconstructive materials and techniques are available to optimize successful CSF leak closure. The management of CSF rhinorrhea continues to evolve with the introduction of new repair techniques, materials, and studies of long-term outcomes. Endoscopic versus open approaches to the skull base: a comprehensive literature review. Oper Tech Otolaryngol Head Neck Surg. 2011; 22: 302- 307. Endoscopic reconstruction of the cranial base using a pedicled nasoseptal flap. Neurosurgery. 2008 7; 63 1 Suppl 1: ONS44-52; discussion ONS52-3 doi: 10.1227/01.neu.0000335010.53122.75.